Guest post by John Hislop. Since I have bought every book ever written about the Hibs, there was never any doubt that I would buy Pat Stanton's Hibernian Dream Team. I have even bought the ones about players who only spent part of their career at Easter Road, like Chic Charnley, Peter Marinello and Keith Houchen, so, when I saw Pat’s advertised, I was hooked. The fact that I got to meet the great man in WH Smith’s at the Gyle was an added bonus, and when I turned up for the book signing, to my delight, ‘Last Minute’ Lawrie Reilly was there as well. As expected both Hibs legends were true gentlemen, and at least appeared to be interested in the ramblings of myself and fellow starstruck Hibs fans, as we queued up for their signatures. The book was written by Ted Brack, a retired teacher and Hibs fanatic. Ted also wrote the excellent There Is a Bonny Fitba Team: 50 Years on the Hibee Highway which is well worth the reading if you get a chance. I must admit, the majority of the Hibs books I have read over the years would probably not appeal to fans of other teams, but this one certainly would. 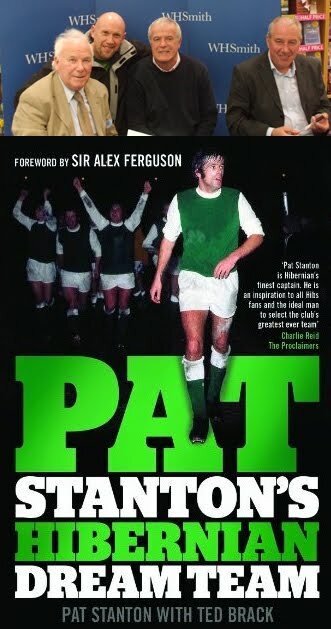 The foreword is by Sir Alex Ferguson who took Pat to Pittodrie as his number two. Had Pat not decided to try his hand at management, there is a fair chance could have been at Old Trafford today such is the respect that Fergie has for him. The idea of Pat picking the best ever Hibs team might not seem to be a riveting subject, but it’s full of personal anecdotes of great and sometimes not so great players of the past. One player whom Pat rated on a par with George Best and Jim Baxter was the late Willie Hamilton, who coincidentally shared the off field interests of the other two. As a youngster, Pat recalls asking Hamilton if he had any advice he could pass on, to which he replied thoughtfully; “Never take lime in your lager son and you won’t go far wrong." The Hearts full back that day, who was ‘apoplectic’ with eyes bulging and veins throbbing, was none other than Jim Jefferies. Pat devotes a chapter to each position and evaluates the strengths and weaknesses of many of the fans favourites, before coming up with a team that could compete against the best. He also selects the best manager, substitutes and even a chairman. In goal he had the unenviable task of choosing between Andy Goram, Alan Rough, Jim Leighton and Zibby Malkowsky, and the other positions were equally difficult. I won’t name Pat’s final selection, in case you want to read the book yourself, but when you consider that players like Stevie Archibald, Murdo McLeod, Erich Schaedler, Peter Cormack, Des Bremner Russell Latapy and Alan Gordon are not even on the bench, then you should realise the depth of talent who have worn the green and white jersey. For the record I didn’t agree with several of his choices, but who am I to argue with the legend that is Pat Stanton? A new signing for The Scottish Football Blog: a warm welcome to guest blogger John Hislop who some of you will be familiar with from Inside Left. John currently works part time for The Southern Reporter as their Peebles Correspondent and previously had work experience with Hibs Interactive and has been published in the Daily Record, Edinburgh Evening News and North Edinburgh News. Strange how life works out. 18 months ago Craig Brown would only have popped to Iceland if he'd heard they had a decent reduction on Werther's Originals. That was then. Now he's masterminding Motherwell's Europa adventure. With a 1-0 lead from the home game Motherwell have travelled to Iceland with a slim advantage over Briedablik. Brown is confident his team can get an away goal. But he's also had them practicing penalties so he's leaving nothing to chance. "Brown sent Jocky Scott to Iceland for a week to watch Breidablik play twice, and the former Dundee manager returned with two thick dossiers. Ahead of last week’s first-leg, which Motherwell won 1-0, Brown arranged a training match with the Fir Park club’s under-19 squad as opponents. The youths played according to Scott’s analysis of Breidablik, using the Icelandic side’s formation and tactics. It was so meticulous that the players even wore the same shirt numbers as the men they were impersonating." "During his spying mission, Scott met up with Jim Bett, the former Rangers and Aberdeen midfielder who is now a coach at Valur. Bett described Breidablik as the best passing side in Iceland, and worthy of their place at the top of the league. The observation was in keeping with Scott’s own views"
Breidablik might not have offered a huge amount in the first leg but 1-0 is hardly a disaster for them. Could be a tough match for Motherwell tonight. The Scottish Football Blog's line is unconditional support of all Scottish teams in Europe this year. Time to get a bit of a respect back for the SPL. Unfortunately experience of many an early season Euro disaster dictates that I offer that support in the spirit of hope rather than any sense of expectation. I'd be delighted Craig and Co. can prove me wrong. * Elsewhere tonight Hibs will find out their opponents in the next qualifying round as Videoton and Maribor meet in their second leg after a 1-1 draw in the first game. A couple of updates on the whole sorry saga of reporting the football fixtures. A quick recap: Agents of the SPL - not lawyers but citing legal stuff - got in touch to say I'd been using the SPL logo without permission. Fair cop, guv. Hands up. Caught me red handed. Images removed. I'd also committed the far murkier crime of reporting the fixture lists for the 2010/11 SPL season. Or the first three weeks of them at any rate. But the fixture lists are copyrighted and can't be used without a licence. I removed the offending information and sought clarification. From the Press Association's Yorkshire HQ I found out that purchasing a licence would cost me more than £3000. A depressingly high chunk of my depressingly low annual salary. "Please note in order to be granted the club's official fanzine, you must have written permission from the specified Football club on the club's letter-headed paper stating they authorise your organisation to be their official fanzine. A licence agreement will then be granted at the cost of £1 + VAT." That's an important chink in the armour and I hope anyone who has a dedicated club blog can make use of it. But it's no good to me. So what can I publish? A list of fixtures is definitely out. Even publishing the weekend's fixtures above or below a post with match previews is not allowed. "Lose the bullet points & match times and transfer that information into a paragraph then that should be fine." Lose the match times? This is a madness and no eloquent defence of copyright laws will persuade me otherwise. But my match previews and crap predictions can live to fight another day. As long as I stick to editorial I should be fine - although this conflicts with information that other blogs had been given or at least with the interpretation of other bloggers. What I can't do is feature more than one round of fixtures. So I couldn't publish a preview on a Friday that looked at both the weekend fixtures and the midweek fixtures. But if I publish a weekend preview on a Friday and a midweek preview on a Monday I'll be fine. People are paid money to make sure that this craziness is enforced. It's almost enough to make me rant long and hard about the madness of a modern world that I'm not sure I'll ever understand. But I'll spare you and stick to just banging my head repeatedly off the desk. I think the SPL and their cohorts in England are misguided on this. The way football is reported and debated is changing and they are deliberately pricing a sizeable constituency out of the market. In the long term I don't think that makes good business sense. I'm also not exactly enamoured with the legal decisions that are letting them get away with it. It raises questions of what constitutes editorial and news reporting that I don't think were suitably answered in previous court cases. A different day, a different judge, and I think the football authorities might have to reconsider their position. I certainly hope so. I don't want to - I couldn't - compete with the newspapers or the BBC on this. But if we've reached the stage where publishing details of three weeks of fixtures or publishing a preview that happens to mention kick off times is not allowed without coughing up thousands of pounds then the game is in real trouble. And the guardians of the game are completely out of sync with the modern media. Anyway these are questions for the future. In the meantime expect references to what I'll be eating for lunch during match previews of games that may or may not be kicking off early. Or how I'll be looking forward to watching games that may or may not be being played on a Sunday when I return from my weekly prayers. All a stupid waste of time. And I would argue that the reporting of kick off times might be covered by the concept of fair use in copyright law. But if I've not got three grand for the fixtures I've certainly not got the cash for a legal challenge on a point of principle. I must say thanks to Jack at Net Result for his prompt and clear replies. I don't agree with him - or at least I don't agree with his professional stance on the issue - and I certainly don't admire the tactic of his company in sending out emails which some people might misguidedly believe are being sent by lawyers. But he's doing his job and he wasn't afraid to engage with the long list of questions I had - and I'll admit my tone was not as friendly as it might have been. No marks whatsoever to the SPL. I've sent two or three emails on the matter. I even opened up my correspondence with them to ask how they feel the blogging community fits into the coverage of the game. Can a game choking with debt and falling attendances, a league that needs all the publicity it can get, afford to turn its back on a growing and, I think, often worthwhile community of bloggers? That's an interesting question. I know what my opinion is but I don't have the same considerations of commerce and income streams that the SPL are forced to juggle with. So I was genuinely intrigued to see how they responded, what plans they have to contend with the trade off between recognising that the internet is changing the consumption of football news and their more traditional role of promoting the game and maximising their revenue. I very much doubt my external links to the SPL are of much value to them. But people were leaving this site and going to the official SPL site - that was largely the point of the two posts I've been asked to remove. This blog's newest policy is to include no outgoing links to the SPL website. I'd encourage other bloggers to do the same. And I'd love to know how they feel about shutting down that avenue of - completely free - promotion. I think there is at least the need to have a debate on this. As their agents had approached me I felt I was as entitled as anyone to raise it with them. They've ignored all my emails. The tragedy is that I'm not at all surprised by their silence. The new season will begin without one familiar voice in the Scottish football blogosphere. Seb at Inside Left has decided to call time on the site before the season starts. It will be missed. Fear not though as Seb will still be giving us the Scottish football view from Holland on Twitter and talking about his beloved - often beleaguered - Aberdeen on The Offside. And I'm going to be bothering him until he agrees to do a few guest posts on this site. But as Inside Left sails off into the Dutch sunset we can welcome a new blogger. Bobby Hunter will be guiding us through a year in Scottish football on his new blog, A Year In Scottish Football. Bobby's already hard at it, taking a look at the problems and challenges facing Walter Smith as Rangers' threadbare squad hit Australia. Australia? In my day pre-season was a long hard run up the dunes at Gullane. Don't know they're born these lily-livered pansies. Up the dunes, Capstan Full Strength in hand and a flask of lukewarm tea when you reach the top. Anyway, good luck to Seb as he rediscovers the world outside blogging about the fitba' - I really must get him to tell me what having a life is like. And best of British/Scottish/Nation-ish of your choice to Bobby as he joins us in our lonely pursuit of the perfect blogpost borne from the most imperfect of sports. Speaking of guest blogging: I've got a couple of new voices lined up as the season gets underway and I might be appearing elsewhere before too long. But I'm always happy to share the burden so if anyone does fancy putting together a few lines please get in touch. You can be as regular or irregular as you like and any football related topics are welcome. This is a vacancy ideally suited to anybody prepared to write for bugger all. Clearly you can't buy a pint of beer with my gratitude but it's all I can offer at the moment. OK. The toys are back in the pram. Equilibrium recovered. The blog lives to fight another day. I'll keep you updated on the fixtures situation. I've sent more detailed replies to both the SPL and their “agents” and their responses will shape how I'm going to cover the SPL and the SFL this season. It all still seems a bit draconian and pointless to me and has absolutely not helped improve my opinion of the people running the game. 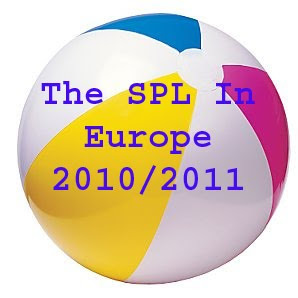 But by keeping the blog going I will at least have a platform to slag them off when they do stupid things like try to keep the SPL Fixtures 2010/2011 – information that everyone in the game surely relies on – from the public domain. I have taken down the offending fixtures but left the posts up with the links to the SPL and SFL sites and all the other content. So you'll still be able to use the blog to find your team's fixtures. Much as you could before. An entirely pointless waste of everyone's time. Anyway no more on that until I've heard back from one or both of the parties involved.